It’s hot. It’s bloody hot, but at least it’s dry. After lots of rain this week, it’s now really hot outside, just in time for a holiday weekend. Better yet, I feel as though my apartment traps heat so there’s no real escape. This is the time of year when it is just excruciating to cook. Anything that causes the temperature to rise inside is to be avoided. Greens wilt. Appetites dwindle. Nothing seems appealing. On the other hand, this is also the time of year when really great produce is available and loads of wonderful fresh fruit is coming into season. I took advantage of the nice weather to check out the newest edition to the farmers’ markets in town. 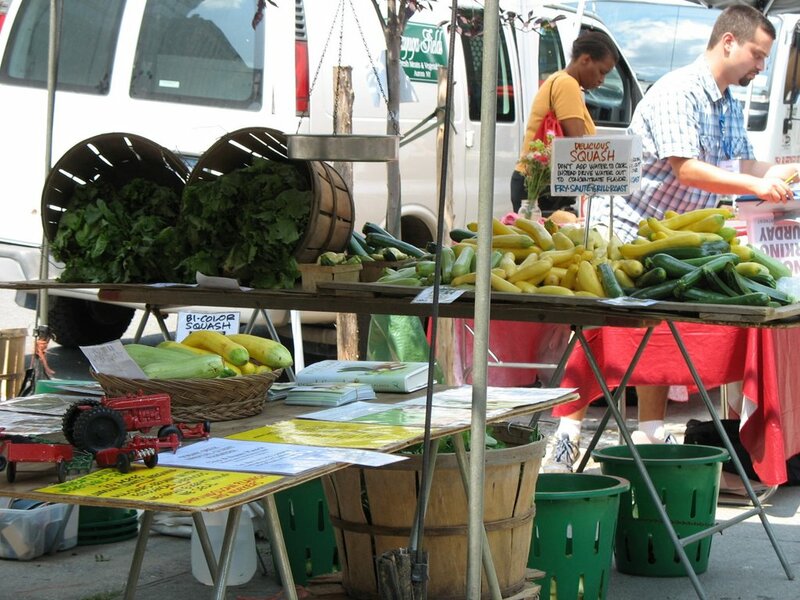 Nina Planck, who used to run the Greenmarkets in New York City, has set up two markets. One of them is on a thin triangle of land on Lafayette Street between Spring Street and Kenmare Street. This is the one that I visited today. The newsletter they sent around said that some of the showings would be lighter as the heavy rain this week caused damage to some of the crops. Nina’s folks came up from Virginia to lend a hand this weekend. Next time, I’m going to try the other market on 6th Avenue between Bleecker Street and Houston Street. 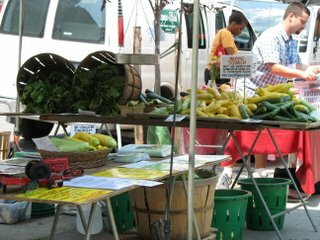 Although, as the photos show, there were some nice veggies available, I didn’t find what I really wanted there, so I ended up at my usual – the Union Square Greenmarket. Unfortunately, it was later in the afternoon, my having been distracted by the England-Portugal World Cup match, so many places were closing up. I did pick up some salad greens and my first fresh local raspberries of the season. Supplemented with some other items I had in the house and a few things I picked up on the way back to my apartment, I threw together a light supper, in tune with the weather. 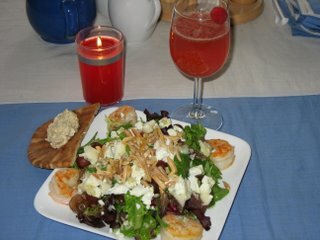 The salad is inspired by one that I used to eat at a restaurant near where I went to graduate school in Washington, D.C. It is light, fresh and full of great tastes. My hope is that it helps you get through this torrid summer as well. Measure out 1/4 cup raspberries per person. Put in food processor and puree until liquid. Add 1/4 tsp sugar per person being served. Puree one minute more. Place fine-mesh sieve over clean glass or ceramic bowl. Empty contents of food processor into sieve. With wooden spoon or rubber scraper, push contents through sieve. Do not try to make seeds and large pulp pieces go through the sieve. The liquid is what is wanted. Measure out one tablespoon raspberry puree per glass. Add one shot of rum. Fill glass two-thirds full with sparkling mineral water. Garnish the rim with one whole raspberry dipped in sugar. Heat griddle pan over medium high heat. (unless you decide to grill them on a barbecue) Peel and devein shrimp, unless bought prepped. Brush with olive oil and sprinkle with salt and pepper. Cook shrimp until pink on one side, flip over and cook until opposite side is also pink. These should take about 5 minutes. Set aside to cool. At the same time, in pre-heated 300o F (150o C, Gas Mark 2) oven, toast slivered almonds until light brown. Remove from oven and set aside to cool. Put garlic, pinch of salt and 1/8 tsp pepper in bowl. Add 1 Tbsp lemon juice and 2 Tbsp olive oil. Whisk together until thickened and turns a light yellow color. Mound mesclun in center of plate. Dot grape halves, almonds and cheese on top of greens. Place shrimp around the plate. Drizzle with lemon-garlic dressing. If wanted, serve with grilled pita bread and store-bought hummus (or in my case from the local Mediterranean restaurant). Variation: Substitute shrimp for grilled chicken and red grapes for green. Yummy! 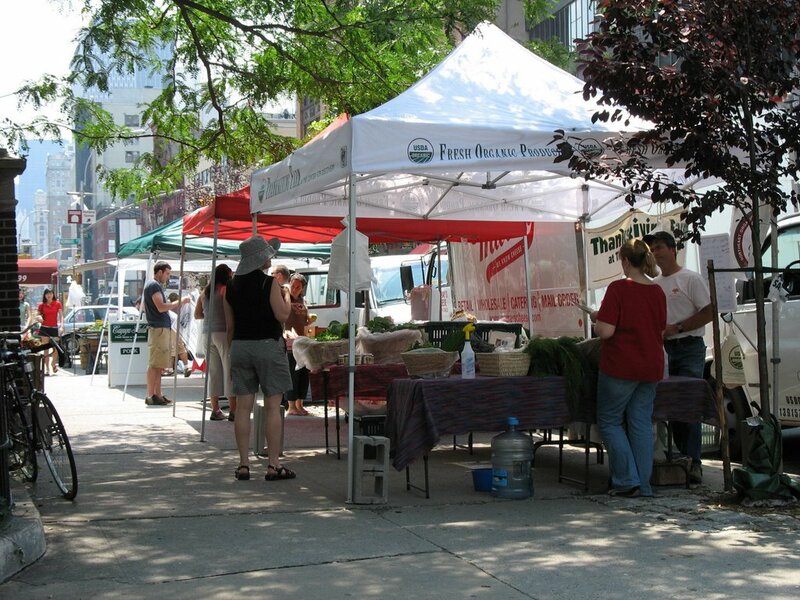 I miss the markets (not b/c we don't have them here, but I seems to stumble on more of them when I lived in NYC. But then I didn't have a kid and spent more time walking the street (during the day)). Is it easier (less hot) to toast almond on the stove? That's how I do my pine nuts (rather than wait for the oven to heat up). It is more or less hot - depending upon just how much heat your stove expends - to toast nuts on the stove. Take a clean pan (doesn't have to be non-stick), place the nuts in the pan over low heat. Make sure to shake the pan periodically to keep the nuts from sticking to the pan. There is no need to add extra oil. thanks for the raspberry rum fizz recipe. just so happens i have some rum i'd like to use and we have raspberry bushes in the backyard bursting with fruit that needs to be used quickly! Jules - I wish I had a raspberry jam recipe to send you b/c that would be one way to keep the fruit for you to use all year 'round. Unfortunately, when you freeze them, they don't really come out the same as when they were fresh. Once exception would be to take an ice cube tray. Fill it 2/3 the way full, drop in a whole raspberry (or two) and let freeze. These you can keep and use in drinks. How pretty would that be to have raspberry ice cubes in your lemonade! Remember the party rings that were used when we were kids - think of it like that for the holidays - you can use them in the punch.